Dallas Restaurants To Spend Your New Year's Eve at! New Year's Eve is a time to celebrate! What better way than with a delicious meal and fabulous drinks? However, picking out the perfect spot to dine can be a challenge – so many choices, how do you narrow it down? Well, if you are in Dallas to ring in 2015, here are a few choices to make your decision a bit easier. Gemma was voted 2014 Restaurant of the Year by D Magazine and consistently appears on Foodable Top 25 Dallas Restaurants list. So, what better place to ring in the new year than at a top pick in Dallas? Gemma is a new American restaurant with international inspiration that stretches from the kitchen to the bar. This cozy and friendly restaurant will be serving their regular menu and offering a few NYE specials. Plus, check out the late seating that starts at 9:30 pm so you can join them in a Champagne Toast at midnight! It's a food lovers dream – literally a dining extravaganza. First up, Casa Rubia is serving up Spanish tapas with a new modern twist. With a menu that changes daily, you will definitely be in for a treat! In more of a Moroccan mood? Walk next door to Souk. The romantic destination will definitely get you in the NYE mood. Plus, you may even see a belly dancer or two. Kitchen LTO is another unique dining destination. It stands for “Limited Time Only” and is currently featuring Chef Blythe Beck. On NYE, she is preparing a four-course menu that will be accompanied by live music. These are just a few of the many restaurant to choose from at Trinity Groves. It's sure to be a fun filled evening with live entertainment and food from around the world. Ring in 2015 in style at The Mansion on Turtle Creek. Chef Bruno Davaillon has two menus to choose from. The first seating is from 5:30 to 6:30 pm and includes a four-course dinner for $100 per person. Some of the menu highlights are chilled lobster, truffle polenta and venison. From 8 to 9 pm, you can choose the six-course menu at $200 per person. The two additions to this menu are a striped bass and stuffed pheasant. Hang out at the bar after dinner for live entertainment from Phil Pritchett & The Full Band– plus a champagne toast at midnight! Celebrate the new year on top of Reunion Tower in Downtown Dallas at Wolfgang Pucks “Five Sixty”. At the restaurant, you will get a five-course prix fix dinner for $200 per person. For an additional $75 per person, you can add wine pairings. Not looking for a full on dinner but think Reunion Tower sounds fun? Party all night at Cloud Nine. For $200, enjoy appetizers, all inclusive drinks, bottle service, champagne toast at midnight, DJ and dancing! Party starts at 9 pm and goes all night. 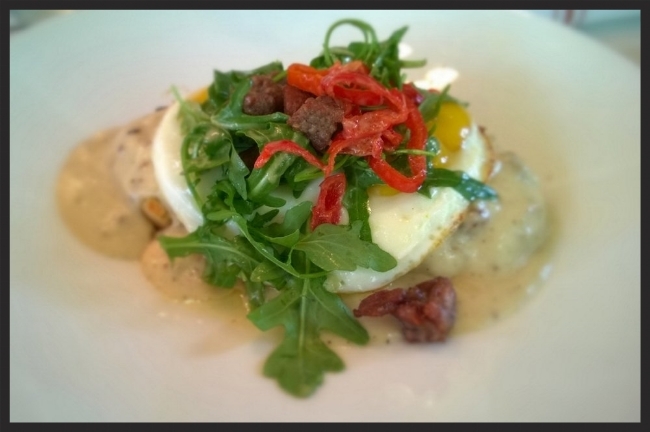 Biscuits with duck gravy & eggs at Boulevardier | YELP, Trinh T.
Kick off 2015 with French flare at Boulevardier in The Bishop Arts Dinner. The pre fixed menu is $105 per person but if you would like the paired beverage menu, it will be an additional $45 per person. With options like Wild Mushroom Bisque, Torchon of Foie Gras, Bay Scallop Crudo, 60 Day Dry-Aged New York Strip and Creme Brulee, you will be saying “laissez les bon temps roulez” by the end of the night! Of course there are many many more fabulous restaurants to choose from in Dallas. But, wherever you choose, you are sure to be entertained and have a fabulous meal. 2014 has been a great year for Dallas and the restaurant industry– so we are looking forward to seeing what 2015 brings!